Verifone is a flexible mobile payment solution used by retailers and merchants from different industries and businesses to process payments on the go, reduce checkout times, increase productivity, and improve customer satisfaction. Designed to adapt to changing business needs and equipped with world-class payment and security technology, Verifone enables merchants and retailers to provide their customers with a secure, fast, and convenient way to make payments. The mobile payment solution is equipped with mobile point-of-sale or mPOS devices that can work seamlessly with the latest smartphones and tablets, and in different operating systems. These devices are built with flexible connectivity options and customer-friendly features. In addition, users can enhance the functionalities of the mPOS devices through the aid of third-party apps which they can download from Verifone’s merchant marketplace. Last but not least, Verifone allows merchants to generate detailed reports and analyze data, permitting them to obtain insights into their transactions and come up with data-driven decisions. Verifone allows merchants and retailers to have a payment solution that gives their customers the ability to pay away from cash registers. With such solution, customers will be able to make payments quickly and conveniently. Verifone is equipped with mobile point-of-sale or mPOS devices that are suitable for all business needs and built to improve how users engage with their customers. The mPOS devices offered by Verifone boast three things: flexibility, performance, and security. All of these devices are compatible with any smartphone or tablet, and any operating system. As a result, users no longer need to invest in a different or new payment solution when they update their device inventory. In addition, the mPOS devices have flexible connectivity options. For instance, Verifone has a standalone mPOS device called e285 which supports wireless connectivity through WiFi, Bluetooth Low Energy (BLE), and an optional 3G or GPRS radio. The e285 can also be connected to smartphones and tablets using the USB-C connector. It can even accommodate different payment methods. Having the capability to process payments and manage transactions with minimal interruptions is one of the benefits that merchants and retailers can get from using Verifone’s mPOS devices. This lies in how long the devices can function before merchants need to recharge their batteries. As an example, Verifone offers the e280, a mPOS device designed for tier-1 and micro-merchants, which has a large rechargeable battery. Because of this, the device can handle more than 300 transactions continuously in over 11 hours. 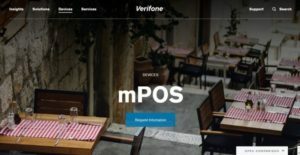 Verifone also permits merchants and retailers to manage all their mPOS devices and other payment devices from Verifone easily from one central portal. Thus, they will be able to control and manage all the payment devices remotely wherever they are. In the event that a particular device is down, Verifone instantly identifies the technical issue and performs troubleshooting procedures. Also, the payment solution allows users to send content to their devices from the portal, letting them introduce new offers and give rewards to customers. With this centralized and remote management capability, they can improve productivity and customer engagement. Verifone permits merchants and retailers to gain insights into their transactions anytime they want. Through the aid of its reporting and data intelligence capabilities, they will be able to monitor transactions and come up with reports. The solution captures transaction data from all channels and summarizes it. Likewise, it organizes all transactions in a way that users can easily view them. They can obtain a high-level overview of their transactions. If they want to drill down into the details, Verifone lets them filter the transactions so they can better discover and understand when, where, and how customers are making purchases. These capabilities drive better decision-making and improve business performance. If you are interested in Verifone it may also be a good idea to analyze other subcategories of Best Mobile Payment Systems collected in our database of B2B software reviews. Organizations have unique needs and requirements and no software application can be perfect in such a condition. It is pointless to try to find a perfect out-of-the-box software system that fulfills all your business requirements. The intelligent thing to do would be to modify the solution for your special requirements, staff member skill levels, budget, and other factors. For these reasons, do not hurry and subscribe to well-publicized trendy solutions. Though these may be widely used, they may not be the best fit for your unique requirements. Do your research, investigate each short-listed system in detail, read a few Verifone reviews, call the seller for clarifications, and finally choose the application that provides what you want. How Much Does Verifone Cost? We realize that when you make a decision to buy Mobile Payment Systems it’s important not only to see how experts evaluate it in their reviews, but also to find out if the real people and companies that buy it are actually satisfied with the product. That’s why we’ve created our behavior-based Customer Satisfaction Algorithm™ that gathers customer reviews, comments and Verifone reviews across a wide range of social media sites. The data is then presented in an easy to digest form showing how many people had positive and negative experience with Verifone. With that information at hand you should be equipped to make an informed buying decision that you won’t regret. What are Verifone pricing details? What integrations are available for Verifone?